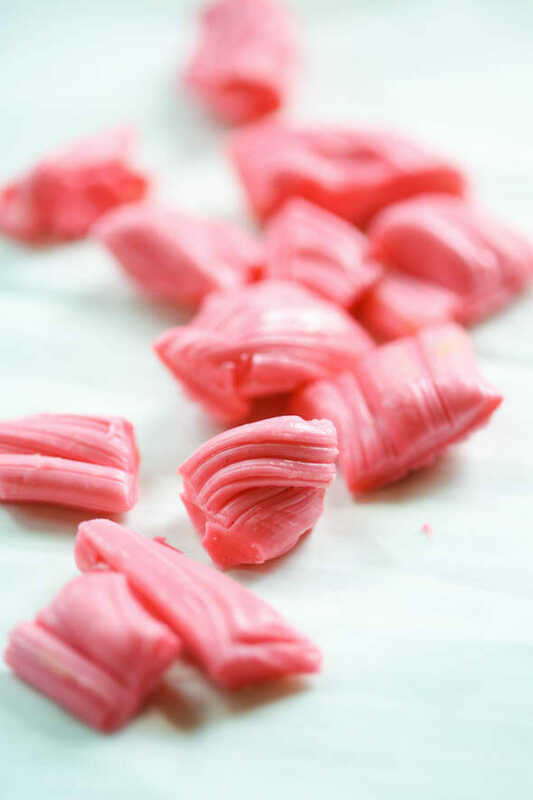 I also vaguely remember making homemade taffy for some kind of pioneer-related activity when I was a kid, but it wasn’t saltwater taffy and it wasn’t flavored, it was just a glob of gooey sugar. But even if it was kind of gross, it was really fun. 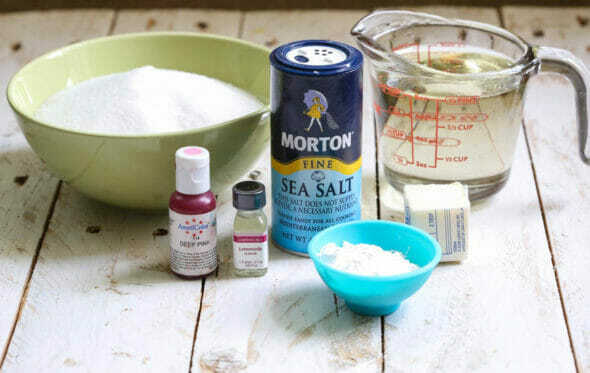 You’re going to need sugar, corn starch, light corn syrup, a little butter, some salt (I used fine sea salt, but regular table salt will work), glycerin (maybe you have some left over from the giant bubble experiment), and a little baking soda. I also used flavor (pink lemonade, to be exact) and food coloring. I recommend using those little concentrated LorAnn concentrated flavors–about 1/2 teaspoon will do the trick and they come in a huge variety of flavors, so if you want coconut or watermelon or root beer or cherry or lime, this is the way to go. Heavily grease a cookie sheet and set it aside. I’m not talking a misting of non-stick cooking spray, I’m talking grab a chunk of shortening and rub it all over the bottom and sides of the pan. You’ll thank me later. Now. You’re going to want to calibrate your candy thermometer. I promise. Two batches of rock-hard taffy later, I realized my candy thermometer was running about 15 degrees too hot, which makes a world of difference in the candy-making world. Side note: there are also sometimes tears and lightly burned fingers from getting impatient and pulling the taffy too soon. I’m making this process look more and more appealing, right?! I keep saying I’m never going to post another candy recipe again because even the best candy makers have stuff that doesn’t turn out and they can’t exactly pinpoint why, but I keep coming back for more. Kind of like how I kept reaching for the taffy that I knew was too hot. I’m a glutton for punishment. Combine sugar and cornstarch, put into a saucepan, and add corn syrup, butter, water, glycerin, and salt. Stir until boiling and boil until mixture reaches 255°F. Add the flavoring and pour onto the prepared cookie sheet. Allow to cool until you can handle it safely (do what I say, not what I do). 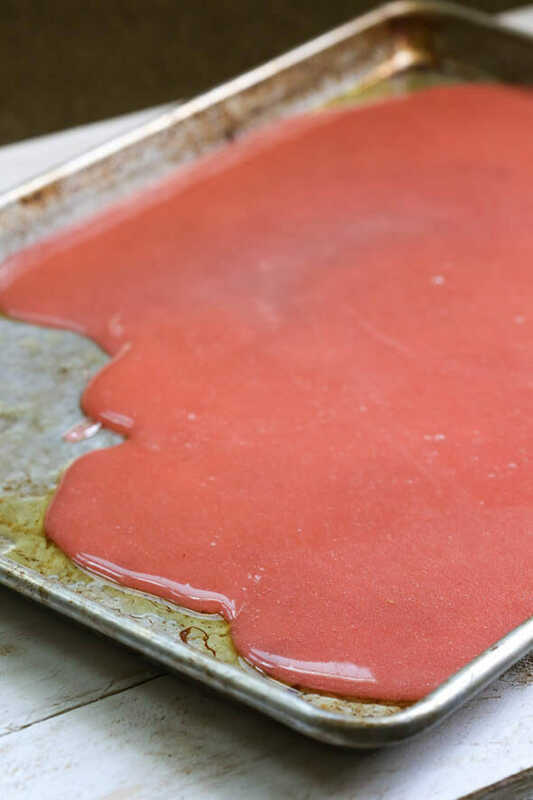 Pull the taffy until shiny and opaque, about 10 minutes. Use both hands to pull it out and then fold the ends on top of each other and pull it out again. and wrap in wax paper. Heavily grease a cookie sheet and set aside. Combine sugar and cornstarch, put into a saucepan, and add corn syrup, glycerin, butter, water, and salt. Stir until boiling and boil until mixture reaches 255°F. Add the flavoring and Pour onto the prepared cookie sheet and allow to cool until you can handle it safely. 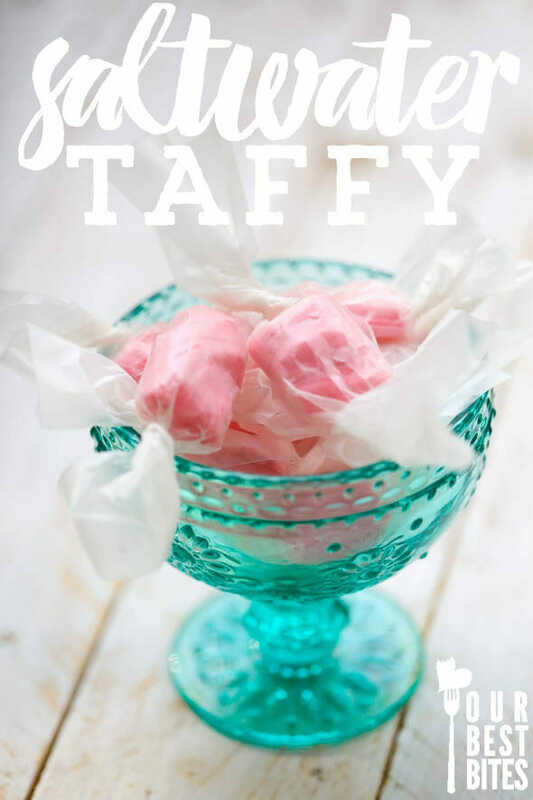 Pull the taffy until shiny and opaque, about 10 minutes. Cut into individual pieces and allow to stand about 30 minutes, then wrap in wax paper. 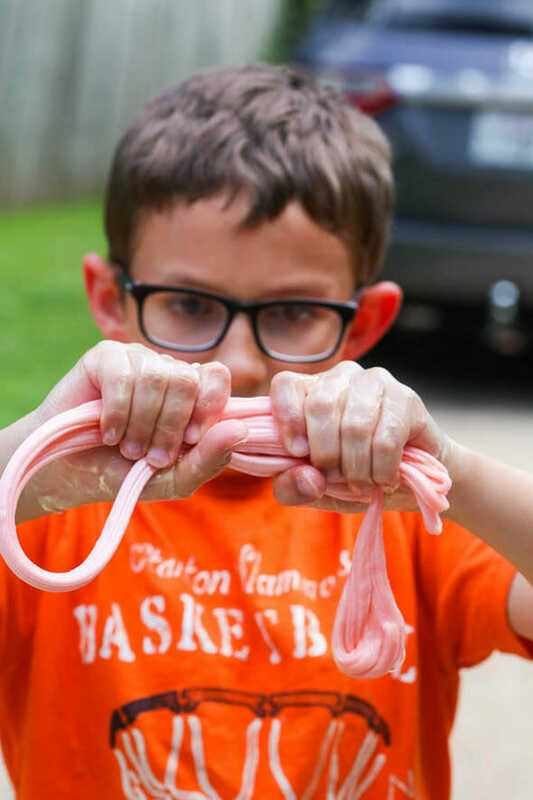 To mix more than one color or flavor, divide the mixture after cooking and color and flavor each individual pot, then pour, pull, and roll the taffy separately. Twist desired flavors together before cutting. Where does the glycerin come into play? Oh I can’t wait to try this with my kids this summer, thanks! Black licorice taffy coming right up. Yummy. I neeeeeed that little dish! I grew up a “city” girl from central Florida and when I was in eighth grade my parents moved us to the boonies of Missouri. As a 17 year old and relatively new to rural Missouri, my then boyfriend (now hubby) and I had some good friends who lived deeper “in the sticks” than we did (we lived “in town” in the boonies LOL). They were newlyweds and hunted, cruised gravel roads, raised rabbits for food (eek), and did all sorts of things I had never heard of. One of those things was making taffy. We tried making it together one night when we were at their house. It actually was great fun (although I remember thinking I had regressed back to Little House on the Prairie days LOL). We made grape and I haven’t made any since. Thanks for the inspiration! Yours looks fun, pretty, and delicious! We will be at a family reunion on the 24th of July and I’ve been trying to figure out something that would make a fun pioneer day activity. I think this is it! Thanks for the great idea. I remember doing this as a kid, too! Such fun. Here is my tip to keep your hands from burning: use butter liberally–like Paula Deen liberally. Don’t be stingy. And keep that taffy moving! Now is not the time to admire your pioneer skills–save that for when you pop it in your mouth and eat your yummy pioneer goodness. My mom used plates instead of a cookie sheet and poured us each a portion to work with so she didn’t have to make six batches to occupy all the kids. The younger kids got a smaller portion which cooled faster, but we were also grateful that the whole batch didn’t get ruined when it didn’t get pulled and ended up in an amorphous-too-big-for-anyone’s-mouth lump. When you mention the temperature, is that at sea-level? I know you have to adjust for altitude, which I didn’t do the first time I made taffy errr doorstops. Ooh, fun! So does this make soft, chewy taffy like you get at Chocolate Covered Wagon? I’m guessing so, since you said the failed batches were rock hard. Dang, this looks like a lot of fun. I’ll bet it would be stellar with honey, too, instead of the corn syrup. I’ll have to try it with the niece and neph this weekend. Thanks! Where do you get glycerin?? Try a place with cake decorating supplies like Michael’s or Hobby Lobby. Many pharmacies also have it behind the counter, or you can order it from Amazon. Hope that helps! Holy smokes!! This is super impressive. I love salt water taffy!! Where on earth do you find glycerine? So I am trying to figure out a way to make this work with a very large group on pioneer day. We are going to have different booths with pioneer activities at each one and kids are going to go from booth to booth. So I’m just worried about whether this will work out logistically. I was thinking that I could separate the taffy into individual portions ahead of time…but don’t they have to stay warm before you pull them? Is there a way to store the taffy in its un-pulled state for a while and then just pass them out as kids come?